Kid Icarus: Uprising Will Be Bundled with a Stupid Stand! Who's excited about Kid Icarus? I sure am. But this ridiculous stand that's packaged with it? Nothankyou. 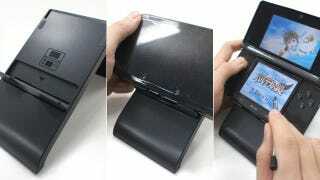 According to Kid Icarus: Uprising designer Masahiro Sakurai, the game will come with this "Nintendo 3DS Stand". The point, Sakurai tweeted, is to keep the 3DS steady during touch-pen play. But isn't that what hands are for? Of course, the stand can be used for other games. Or like some other Nintendo peripherals, it can collect dust on your bookshelf.